The Darwin 2008 Calendar of Events and Festivals will have something to interest everyone. On The Origin of Species. If you are organising an event in Darwin during 2008, please use this form to send in the details so we can publish as soon as they are available. Family Fun Day Out for parents with children 0-12 years of age. 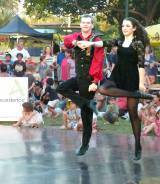 Ben 10 & Angelina Ballerina are the major acts together with specialty speakers, sporting demonstrations and fashion parades. by The Folk Club Quartet. Crowne Plaza Hotel, Mitchell St. Fishing the Finniss River, approx 10 klm south of Dundee Boat Ramp. Accommodation available - Air con Rooms or camping facilities. Bynoe Harbour Camp Out & Fishing Comp. Go Red on black Friday!! Heart disease is a women's disease too! Get your girlfriends together and Go Red For Women. Support the Heart Foundation in raising funds for research into heart disease and help us celebrate real women; real hearts. Tickets $75 and available by calling 8981 1966.